This was a very memorable August morning for me in Rocky Mountain National Park. It was mid August and a cold front had brought rain to the Front Range. Temperatures from this system were very cool and I expected to find some of the highest peaks in Rocky Mountain National Park perhaps coated with a light dusting of snow near their summits. I headed up Trail Ridge Road in the predawn hours hoping to capture images of the clouds trapped in the valley's at the lower elevations at sunrise. As I headed up Trail Ridge in the pitch black and thorugh a very dense fog I started to notice what looked like snow up above the Forest Canyon turnoff. I wasnt sure if my eyes were playing tricks on me or if there was actually snow above 10,000 ft. It was mid August afterall and summer was still in full swing in Rocky. It became apparent as I gained elevation that it had indeed snowed, and as I drove past the Rock Cut, I could see there was a nice dusting on the alpine tundra. I continued to drive on a very icy Trail Ridge Road that most likely would have been closed if anyone was aware that snow had fallen on the road until I arrived at the Medicine Bow pullout. 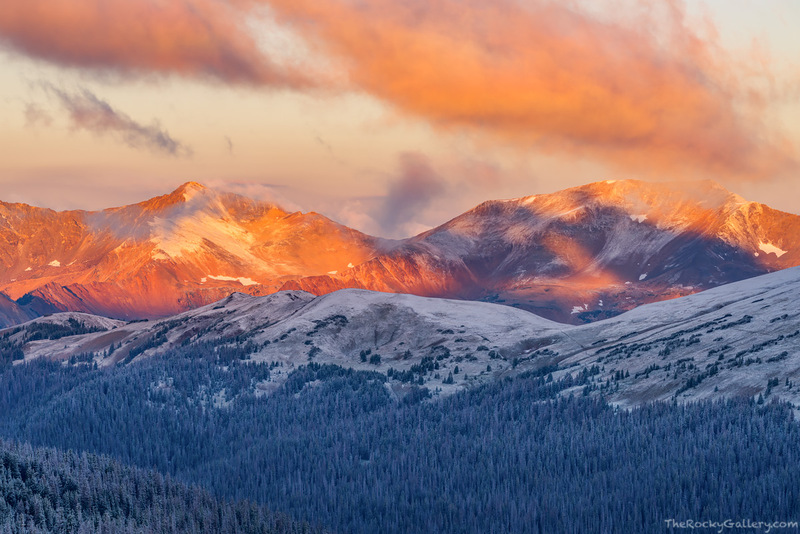 From the Medicine Bow overlook I watched a stunning sunrise light up the Never Summer Range as the clouds drifted over the peaks. The combination of warm reds on the Never Summer Range and the cool blues of the coated evergreens just above the headwaters of the Cache La Poudre were awesome. It was a dynamic morning August morning and one I wont forget anytime soon. Photo © copyright by Thomas Mangan.